Notable Bulldogs | Home of the Bulldogs! Jaleesha was a member of the King’s Fork Volleyball team and received her B.S. in Chemistry from Virginia Commonwealth University in 2012, and received her Doctorate of Physical Therapy from the Howard University School of Medicine in 2016. Jaleesha is also a proud member of Delta Sigma Theta Sorority, Inc.
Lataisia Jones became the first black recipient of a Doctor of Philosophy degree at the Florida State University College of Medicine in August of 2017. During her five years at FSU, she worked under Professor Pradeep Bhide, the Jim and Betty Ann Rodgers Eminent Scholar Chair of Developmental Neuroscience in the Department of Biomedical Sciences. She successfully defended her dissertation on dystonia, a disease causing involuntary muscle contractions, and was awarded her degree in neuroscience. Jones’ path to FSU began at Virginia State University, where she earned her bachelor’s degree in biology. All Southeastern District in Football and Basketball at King’s Fork High School. Received a Football scholarship to Morgan State University where he played and lettered for four years. After graduating from college he returned to teach (CTE) at King’s Fork High School where he also coached. Mr. Miller currently serves as an administrator at Elephant’s Fork Elementary School. His jersey hangs in the Hall of Champions at King’s Fork High School. At King’s Fork High School, Keith was an AAU national champion in the 4×400-meter relay, running 3:10.42 ; three-time AAU All-American, twice in the 4×100-meter relay and once in the 200-meter dash . As a senior, he was ranked No. 3 in the nation in the 55-meter dash, and recorded the sixth-fastest time in the event in state meet history . He ranked No. 1 in Virginia in the 55 and 200-meter dashes , earned No. 2 ranking in Virginia in the 300-meter and 400-meter dashes, and also ranked third in the nation in the 300-meter. He finished runner-up at the 2008 VHSL AAA state meet in the 100-meter and 200-meter dashes. He was also part of King’s Fork High School’s first 4X100 Relay State Championship team. Keith won a Track Scholarship to Virginia Tech where he won ALL-ACC Honors and ALL-ACC Academic Honors as a sophomore in the 100 and 200 meter dash. He earned second team All-America honors with a 12th place finish in the 60 meter at the NCAA Championship, running his second fastest time ever in the event (6.62) . Keith qualified for the 2016 US Olympic Trials in the 100m and 200m where he was a semifinalist. Keith is currently a professional track athlete. Ta’Shauna was the King’s Fork Women’s Basketball MVP all four years, Southeastern District Player of the Year three times, 1st Team All-State as well as a McDonald’s All-American. She graduated with King’s Fork’s records in career points, assists, rebounds and blocks. Ta’Shauna was the 2010 Big East Rookie of the Year, as well as First Team All-Big East, a feat she repeated all four years. That year she led the team to new heights, propelling them into the national rankings for the first time in fifteen years, and helping the team to just its second NCAA Tournament invitation. In her sophomore year, she led the team to the NCAA’s Sweet Sixteen with an upset win over rival Maryland, before losing to Uconn. In her four years, she amassed 2,518 points to become the leading scorer all-time at Georgetown on either the men’s or women’s team. She was a three-time AP Honorable Mention All-American, and majored in English. Sugar was selected 2nd in the 2nd round of the 2013 WNBA Draft as the 14th overall pick by the Minnesota Lynx. During the WNBA off season, Rodgers joined the Arras team in France. She was traded to the New York Liberty where she is currently having an outstanding career. In 2016 Sugar won the WNBA’s Most Improved Player Award. Sugar is also a published author. Sugar was most recently named to the 2017 WNBA All-Star Team representing the East and finished second in the All-Star Three Point Shooting Contest. JaQuon was twice named All Southeastern District, Southeastern District Player of the Year, 1st Team All-State, 2009 AP AAA Player of the Year for the State of Virginia. He received a basketball scholarship to the University of the Cincinnati. Parker played four seasons (2010-13) for Cincinnati, helping lead the Bearcats to three NCAA Tournament appearances, including the 2012 Sweet 16. A hard-nosed and determined player, Parker averaged 10.9 points and 4.8 rebounds during his senior season while leading all BIG EAST Conference guards (and ranking 12th nationally) in offensive rebounds. JaQuon currently serves as program assistant with the Bearcats. He was elevated to the position in August 2016 after working as the assistant director of student-athlete development since August 2014. Davante concluded his three-year varsity career at King’s Fork High School with 1,431 points and 992 rebounds. Davante is just the third player in school history to collect more than 1,000 points . Davante was an All-Eastern Region selection in 2009-10 after helping the Bulldogs to their second-straight district championship and third-straight district tournament title. Davante was voted the city’s player of the year and was tabbed to the all-city team , tabbed to the Virginia High School Coaches Association Group AAA All-State Team and all-district squad (second-straight year) as a senior. He averaged 22.2 points, 12.2 rebounds and 2.1 blocks per game and collected 21 double-doubles in 27 outings . As a junior in 2008-09, he was a second team all-state honoree and helped King’s Fork to the Group AAA state championship team claiming a 49-47 win over William Fleming HS in the title match-up . He averaged 15.6 points and 7.6 rebounds per contest that season for the Bulldogs, who finished the season 31-1 overall . Davante received a Basketball Scholarship to Marquette University where he was the recipient of the Most Valuable Performer Award, earning the BIG EAST Sixth Man of the Year award for the two straight years … All-BIG EAST Second Team … Preseason All-BIG EAST First Team selection. Davante is currently playing professional basketball overseas in Japan for the Nishinomiya Storks. He is averaging 25.4 points and 9.1 rebounds and was named the Most Valuable Player in the National Basketball League All-Star game in Japan. Chuck was listed as the No. 29 prospect in Virginia by Rivals, a second-team Group AAA All-state selection by Virginia Preps and first-team All-Eastern Region selection. At defensive back, Chuck was the Southeastern District Defensive Player of the Year both his junior and senior seasons. Chuck was a first-team All-Tidewater selection by The Virginian Pilot as a senior after picking off four passes, returning three of them for touchdowns. He was a two-time All-Tidewater first-team selection, a first-team All-District defensive back and second-team running back and First-team All-757 … Chuck also played basketball and ran track for the Bulldogs. Chuck received a Football Scholarship to Virginia Tech where he was a member of the 2014 All-ACC Academic Football Team. Chuck earned ALL-ACC Honorable Mention for his performance during the 2016 Season. Chuck was the first Hokie off the board in the 2017 NFL Draft, selected in the sixth round by the Baltimore Ravens at the safety position. 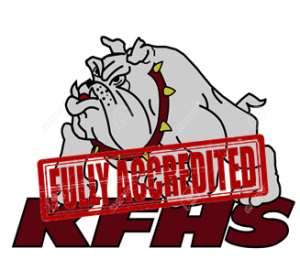 While at King’s Fork High School Kristi participated in Field Hockey and Track. She received an appointment to the United States Naval Academy in Annapolis, MD. Kristi graduated and received her commission from the United States Naval Academy on May 27, 2016. She has a degree in Political Science. She is currently an Ensign serving on board the USS Leyte Gulf as a Surface Warfare Officer (SWO). While at King’s Fork High School, Caleb Parsons was named a 2015 Military Child of the Year by Operation Homefront. Operation Homefront, a national nonprofit that provides emergency assistance to military families, bestows the nationwide, annual award on one military child each from the Army, Marine Corps, Navy, Air Force, Coast Guard and — new for 2015 — the National Guard. Caleb was a member the Men’s Swim and Cross-Country teams at King’s Fork High School, where he won the Co-Captain Varsity Award, Junior Varsity Award and Sportsmanship Award. Caleb is currently in his second year at the United States Military Academy at West Point. Frank Bane was the first executive director of the Social Security Board and the official who drew up the nation’s Social Security program. Mr. Bane was one of the most influential yet least known men in the federal government from 1930 through the 1950s. He helped develop the concept of public welfare into a major governmental function. During World War II, he organized national rationing of tires, cars, gasoline, sugar, coffee, meat and other commodities. He was Regents’ professor at the University of California in Berkeley in 1964 and lectured at universities here and abroad until 1976. Mr. Bane was born in Smithfield, Va. He earned a bachelor’s degree at Randolph-Macon College in Ashland, Va., and did graduate work at Columbia University. He taught in Virginia, served as the principal of King’s Fork High School and Superintendent of Nansemond County Schools. Mr. Bane later went to Tennessee as director of the state’s public welfare program.